Read West Ham v West Brom live text. That's all from us on this page for now. Stay tuned to our pages for more on the reaction from White Hart Lane. Follow the rest of the West Ham v West Brom game here. Tottenham boss Maurico Pochettino said: "Chelsea had only one shot on target and it was a good save from Hugo Lloris. They did not do much to win the game, we deserved more, we tried to win it. I think Chelsea will be happy with the point. It is more important to them than us." Jose Mourinho said: "I have my team back playing as a team again, we have better spirit. I look to the future we have three matches at Stamford Bridge in December and Manchester United and Leicester away. "I think a good December awaits us." Our first goal of the day has come at Upton Park - Mauro Zarate curling in a lovely free-kick. Follow that game in full here. Ryan Mason rolled his ankle and went off injured, with Spurs boss Mauricio Pochettino saying that the midfielder will be assessed in the coming days. A fairly slow start to the game across London too, Mauro Zarate's screwed shot wide the best opening so far. Jose Mourinho said: "I am more than happy with the performance. I am happy with the team collectively. It was the best Chelsea performance of the season, against a dangerous team. My players did everything to try and interpret my defensive ideas the with ball. "We had control of the game and had the best chances. "My team deserved more than a point." Tottenham boss Mauricio Pochettino says his players are "heroes" for the effort they put in this afternoon. He agrees that that was Chelsea's best showing of the season. Jose Mourinho said he has "no issue" with Diego Costa after the striker was left on the bench for the match and appeared to throw his bib at the Chelsea manager. "If he (Costa) watched the game with some attention from the bench he will know what is needed from him." And our second game of the day is now under way. You can follow all the action from Upton Park here. Do we agree that that was Chelsea's best showing of the season? And where can they go from here? It's good to see a player being unhappy for not playing. Unlike some players who are just happy to sit on the bench and take their money. 'The best Chelsea of the season' is Jose Mourinho's analysis of the game. he is a happy man after that showing. Chelsea forward Eden Hazard: "It's always difficult to play here, last season we lost 5-3 and we tried to get revenge. It is a good result, we didn't have many good chances but Hugo Lloris made a good save from me. "A beautiful save, the game could have been a win for us if that goes in." Well what did you make of that? Was it a good result for either team? How frustrated must Diego Costa be? Will there be ramifications for throwing his bib? walebakare: Costa not happy... I doubt there would be any hugs and kisses after this. Ar vind: If Spurs are really ambitious of a top 4 spot, they need to be beating teams in the bottom half of table. Nicolas Anelka was known as 'Le Sulk' at times during his career but perhaps current Chelsea striker Diego Costa is made of similar stuff. He was left out of the side today and after spending most of the second-half warming up, he was not brought on. As Chelsea's final replacement came on in added time the striker threw his bib behind him, landing at the feet of manager Jose Mourinho. All over. No midday classic at the Lane. Ruben Loftus-Cheek replaces Pedro to kill a bit of time, that's Chelsea's final sub and Diego Costa chucks his bib towards Jose Mourinho! Not happy. Martin Smith: If you sack me Roman, I'm taking my ball with me. Dave Prince: I can't catch a break. Let's see if I can catch this ball ..... Oops! Peter Campbell: He's done it! José has caught the golden snitch! Cliff Brown: They say I don't have a magnetic personality anymore huh? Well look, LOOK! Chelsea do make a change but it's not Diego Costa coming on but Kenedy - he is on instead of Willian. One shot each in this half. Harry Kane tries an overhead kick but misses the ball. Petering out to a 0-0. Five minutes left. Diego Costa continues to warm-up. Sheldon W. Serrao: Mourinho to the Magic 8 Ball: "Will I lose my job before Christmas? *shake* ... Ask again later?? We want your best captions for this picture of Jose Mourinho. You put a lot of thought into that one Mathew, good to see. Back on the pitch Chelsea keep the ball alive and Pedro's cross is a good one - but Toby Alderweireld heads clear. Mathew Penistone: Ahhh a ball. My circus could use one of these for Deluded and Paranoid, our ball juggling seals. Mark Bates: If I keep this we can't concede. Donald: Wonder if I can increase my team's possession stats by holding on to this ball a little longer. In a 30-second spell which rather sums up the Premier League at the moment, a defensive error lets Chelsea in but Eden Hazard and Oscar don't quite have the skill or the composure to capitalise and Spurs recover, before giving the ball away again. Pedro fires over to ironic cheers. If you'd prefer build-up to West Ham v West Brom (14:05 GMT) I won't blame you. You can follow that one here. Robert Kovacs: Use the force Jose. Stewart Craig: "Precious, my precious"
Fresh legs needed, and Spurs send on Clinton Njie for Son Heung-min. Can he revitalise this one? Marsh: After a terrible start to the season the "Special One" resorts to his former career as a magician at kids parties. Declan cairns: Hope Eden doesn't kick me when I catch this. ciaran poole: After his management career started stalling, Jose turns to volleyball. Eden Hazard had Chelsea's first effort on target in the 68th minute - but they had to wait 70 to have one against Manchester City in August. Will they have another? Will either side have another? Both teams playing like sides who had long midweek trips now. Ponderous. Alex Percival: Watch this! This is why I could let Cech go! Greg Henderson: Look, I am so Special I can levitate footballs. Andrew Priestley: I wonder if I can hold onto this ball for longer than I can hold onto my job? Get involved via Twitter #bbcfootball. Ooooh but there we go! Cracking save from Hugo Lloris! Eden Hazard arriving on a deep left-wing cross, almost Van Basten style, hits a volley low and hard and Lloris reacts superbly to push it around the post. The first half was a good nil-nil, this is just a nil-nil. Chelsea do have a presentable counter-attack on the cards but Willian's ball from right to centre is undercooked and Pedro can't gather it in. Never let it be said that we can't make our own fun. Scrappy second half now. Nemanja Matic clatters Christian Eriksen in the centre circle and goes into the book. West Ham boss Slaven Bilic makes three changes from the defeat by Tottenham last week. Angelo Ogbonna, midfielder Pedro Obiang and forward Mauro Zarate replace James Tomkins, Mark Noble and Andy Carroll. West Brom beat Arsenal last time out and boss Tony Pulis makes one enforced change as defender Gareth McAuley replaces the suspended Chris Brunt. West Brom XI: Myhill, Dawson, McAuley, Olsson, Evans, Morrison, Fletcher, Yacob, McClean, Sessegnon, Rondon. A change for Spurs then, the crocked Ryan Mason replaced by Erik Lamela. A change of role for Moussa Dembele who will drop back alongside Eric Dier. The heatmap is rather cold for touches of the ball inside the opposition penalty area. Today's front men Harry Kane of Tottenham and Chelsea's Eden Hazard have managed just one touch each inside the box they are attacking. Eden Hazard is back with us after a spot of treatment and now Tottenham attack well, Ryan Mason overlaps on the right and cuts inside Kurt Zouma. He crumbles to the deck and the replay shows that he went over nastily on his ankle. The stretcher is called for but the England man is able to limp off. Crunch! You can't challenge like that any more, as Jan Vertonghen steams into the back of Eden Hazard on the halfway line. A clear booking. Hazard had toed the ball away. Eden Hazard, Willian and Oscar form a triangle, isosceles, on the left of the Spurs box. Too close together? But they do work it out and win a free-kick. Willian whips it in and Kurt Zouma is close to meeting it, but it bounces away from him and Hugo Lloris pouches the ball. Very scrappy start to the second half as the wind does seem to be making life difficult. Spurs then have a strangled penalty appeal shouted down, a volleyed cross did hit Oscar on the forearm. Back under way at a blustery White Hart Lane. One change at half-time, in the seats behind the dugouts Diego Costa is now wearing a bobble hat. Solid choice. In the final of the Davis Cup Andy Murray has just taken the first set from David Goffin. If tennis is your bag you can watch and follow that one here. Has anyone noticed Spurs have made more fouls than anyone else so far in the PL this season? The old Chelsea tactic to prevent a breakaway. Celtic are seven points clear at the top as it stands in Scotland thanks to an early goal from Callum McGregor. You can follow that game here. I would say that Chelsea's change in approach has been a success, they have certainly carried more of a threat than in other games of late. But at the same time they didn't have a shot on target and you could argue that Diego Costa may have netted the header that Eden Hazard put over. This is only the second time this season than Chelsea have failed to attempt a shot on target in the first half of a Premier League game (also 0 v Man City away in August). And there's the half-time whistle. Oooof! A really heavy challenge from Kyle Walker on Cesar Azpilicueta, that's a booking. And Harry Kane also caught Cesc Fabregas with the point of his arm too. Kane is on a booking and needs to be careful. Harry Kane gets away from Kurt Zouma, receives the ball to feet and shoots over the top. No backlift. Eric Dier now loses the ball in midfield and the Chelsea break is on. The quick switch to Pedro is the pass but Willian can't play it quickly enough, and Harry Kane is booked for chopping across him and taking him down. Really strong midfield play from Eric Dier as he shrugs off the attentions of Nemanja Matic and threads a pass to Son Heung-min. No hesitation from the Spurs number seven, he hits it early but it's always rising over the top. A very enterprising game - we just need a goal. Cesc Fabregas takes a free-kick quickly on the halfway line - this is how the goal came against Norwich - but this time he overclubs the ball clean out of play. Chelsea (right) were forced to play quite deep early on but have managed to push out as they have grown into the game. Holding midfielder Nemanja Matic (21) has now been able to take up his more customary shielding position in front of the centre-backs yet Tottenham (left) are still quite high up the pitch. Look at the gap between goalkeeper and centre-backs. Can Chelsea exploit that area? Good hit! Moussa Dembele weaves away from a half-hearted challenge in midfield, gets the ball on his left foot and fires in low and hard. Asmir Begovic watches it all the way and makes a one-handed stop. Good save! At the other end Eden Hazard is clattered by Danny Rose, who is booked. Hazard put in a real sprint down the sideline to get there. Tweet using #bbcfootball, text us on 81111 or use the BBC MOTD Facebook page. A very watchable 0-0 at the moment. Chelsea have been on top for 10 minutes but now Spurs fashion a good chance, a cross from the right picks out Son Heung-min at the far post and his header is clawed away by Asmir Begovic. Willian wins the ball back and flashes in another dangerous cross which Kyle Walker hooks away. Jose Mourinho steps towards the edge of the pitch and offers the players a warm round of applause as the away end sing his name. Much better from the Blues. This one is warming up now. Oscar out on the left, drifts past his man and delivers a telling cross, Eden Hazard isn't the biggest but wins the header, he just can't keep it down. Decent chance. Tottenham (left) are playing a much higher defensive line which is almost at the halfway line, with Chelsea (right) pushed back towards their own box. Chelsea's holding midfielder Nemanja Matic (21) is almost playing as a third central defender in between Kurt Zouma (5) and Gary Cahill (24). First real effort of the game, and it comes from Harry Kane! Jan Vertonghen plays it in to Christian Eriksen, he dithers a touch on the edge of the area and is tackled, Kane takes no time at all and bangs in the early shot. Plenty of swerve on the ball and Asmir Begovic sees it late and punches it away. At the other end Pedro - who has started really well - almost gets clear but Toby Alderweireld is able to clear. A long punt over the top from Chelsea, Jan Vertonghen hesitates and Pedro puts his foot down, chasing down the ball at real pace until Hugo Lloris comes out and takes charge. Not a chance as such but a warning to the Spurs backline. Clash of styles so far. Spurs having nearly all of the ball, Chelsea going very direct. Free-kick for Spurs on the right wing, Christian Eriksen takes his time over the ball but delivers a poor cross, really easy to deal with and Chelsea can clear their lines. There's that pace as Chelsea spring Pedro behind the offside trap, in on goal, but Hugo Lloris is stationed on the edge of his area and is able to sweep up superbly. Tottenham playing a high line and compressing the play. Playing with fire? Chelsea are not short of pace in that front four and Pedro does well to pick out Willian on the right, the Brazilian flashes in a low cross but it's an easy pick for Hugo Lloris. Chelsea have had 26% of possession so far. They are all about hitting on the break. 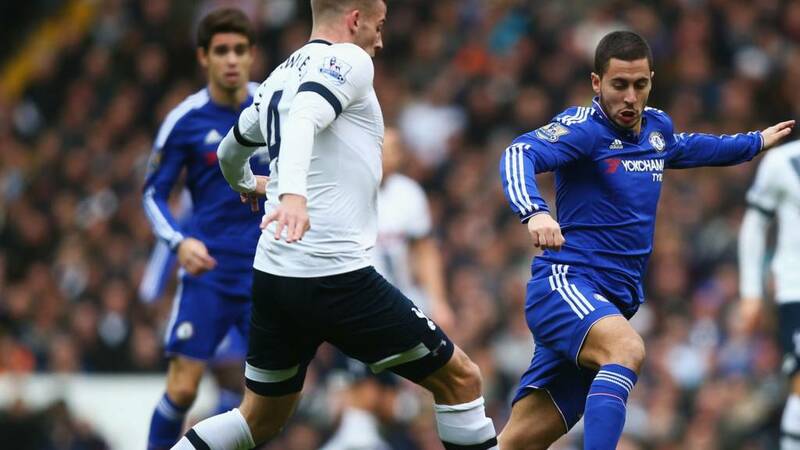 Eden Hazard looking to run in behind the Tottenham defence and stretch the play in that central role. Jose Mourinho has been critical of the dropped Diego Costa for not doing just that. Chelsea can't find the Belgian though as again Cesc Fabregas finds a white shirt. Asmir Begovic took a clunk to the head but he's OK to carry on. The corner is poor and Chelsea clear, but that opening exchange was an indication in the difference in intensity between the sides. Chelsea have to play smarter, harder and faster. Cesc Fabregas plays a lazy pass to Nemanja Matic and Moussa Dembele is onto it in a flash. More hunger and speed in the Spurs midfield. Tottenham then switch it to the left, Danny Rose flashes in a low cross and Harry Kane is close to turning it in, Asmir Begovic making a block at the near post and taking a whack in the process! Eden Hazard has started as the main central attacker for Chelsea. Let's see how that develops. Harry Kane's name gets the biggest cheer as the sides are introduced to a sell-out crowd. The TV cameras are all focussed on Eden Hazard, who hasn't scored in 16 Premier League games. Best player in the league last year? There's one Scottish Premier League game this afternoon and it comes in snowy and cold conditions in the highlands. "One of the biggest highs I've had in football," was how Eddie Howe described Bournemouth's 3-3 draw with Everton. What a game! Ross Barkley scored the latest goal of the Premier League season when he made it 3-2 to Everton after 95 minutes but Junior Stanislas broke that record three minutes later. "It's unbelievable how football can play with your emotions," Howe said. "To score in the manner we did at the end was one of the biggest highs I've had in football. An incredible day, though this game is no good for your health. I'll be having an early night tonight." Toby Carvery: Hazard starting up front? That could really work with someone as pacy and dangerous as himself. Jonny Duch: If I was Remy, I would be furious. Quality striker. Is it interesting that Jose Mourinho says things are not good with Diego Costa's confidence a few minutes after he drops him? He scored the winner last week? Or was Costa well overdue a benching? Chelsea boss Jose Mourinho on BT Sport: "I am not bluffing. Tottenham are title contenders, I really think that. They are a really good side. "For us every game, every point is important. We know what position we are in, we know we will leave that position but we need points. Every match, we try to win. "It is the first time Diego Costa is on the bench when fit. It is normal, he is playing every match and things are not going really well for his confidence. Pedro is a dangerous player." Former Netherlands midfielder Clarence Seedorf gave a lengthy interview to BBC Sport this week, in which he was asked about Chelsea boss Jose Mourinho. "I can just imagine the frustration within Chelsea, especially from the coach. Practically the same team won the Premier League title last season. "When I have played in successful teams that experienced a loss of form like that, a lot of the time nobody could really say why. It could be the same at Chelsea, but the only way to get out of a crisis is if everyone sticks together. "The risk is that you focus too much on the reason why things are not going well and finding somebody to blame. The focus should be on the quality of the team and remembering what their capabilities are. "It is great that Jose Mourinho is still there on the bench because the most important thing for the players is to keep on believing in his philosophy that brought them success last year, and so much other success in the past." Mark Lawrenson has had his say on today's game but what do you think? Predict the result to this and the rest of today's games using our predictor game. It's a blustery morning in north London as bescarved fans make their way into the Lane. The flags are flying at full steam ahead. Can this be a season-changing game for Chelsea? Or will Spurs win and move ahead of Arsenal? Big clubs, they cope with difficult moments. "We played a Champions League semi-final against Atletico Madrid - Wednesday and Tuesday. In the middle we had to play Liverpool. So we play Sunday before the Champions League. If it's not a problem for us, it's not a problem for Tottenham. Tottenham line up as expected with England striker Harry Kane leading the line at White Hart Lane. They make on enforced change as Ryan Mason comes into midfield in place of the suspended Dele Alli. Chelsea make three changes to the side that beat Norwich last time out as Gary Cahill, Cesar Azpilizueta and Oscar come in for the injured John Terry, Kenedy and Diego Costa who is dropped despite scoring the winner against Norwich last weekend. Spurs boss Mauricio Pochettino says there "are no excuses" for his side today despite their long midweek Europa League trip. "Tottenham look more impressive with every passing week, but this will be a real test of their top-four credentials against opponents they have rarely beaten in recent years. "Last season's 5-3 win on New Year's Day is their only victory over Chelsea in the last dozen meetings between the clubs. "Spurs have coped pretty well with the Thursday-Sunday schedule necessitated by the Europa League, but Qarabag was almost a 5,000-mile round trip. "Chelsea, on the back of two league and cup wins without conceding, will have the advantage of two extra days rest, having played in Israel on Tuesday." It could be that Pedro is going to start as a central striker for Chelsea today, having just listened to Jose Mourinho. A good option? "When you're not in a purple patch it's all about being brave, putting yourself in position to score goals and Harry Kane did that at the start of the season. He's not frightened or embarrassed to miss and his team-mates rely on him and trust and he likes the pressure." There is no Dele Alli in the Tottenham side. Moussa Dembele takes his place in midfield as Spurs make three changes from their Europa League side. Chelsea do play Eden Hazard - but he starts up front. It looks like it anyway. There's no Diego Costa. Also in are Kurt Zouma and Branislav Ivanovic. In honour of the 12pm start in the Premier League today, we want to hear your kick-off day woes. Ever missed a game because it was too early? Played in more than one game in a day? Or like my colleague get taken off the substitute bench to play for the opposition. Ever had a tricky kick-off time? "Manchester United missed the chance to go top of the Premier League after another colourless display from Louis van Gaal's side earned a point at Leicester City on Saturday. "United remain in third place behind Manchester City and Leicester - but are they betraying recent Old Trafford traditions with their conservative approach, and can they seriously expect to mount a title challenge playing in this manner? "In 14 Premier League games this season, they have scored 20 goals from 146 shots with 53 on target. Even in the misery of the David Moyes season in 2013-14, they had struck 22 times after the same number of games. "In Sir Alex Ferguson's final title winning season in 2012-13, at this stage of the campaign they had scored 33 goals from 229 shots, with 84 on target." Manchester City boss Manuel Pellegrini is not worried despite Sergio Aguero limping out of their 3-1 victory against Southampton that sent them top of the table. He left after 64 minutes of his third game back after a hamstring injury. But Pellegrini said: "I spoke with Sergio before the game and he was not going to play more than 65 minutes. In the last play he received a kick in his heel. We will see tomorrow but I don't think it was anything important." After that little rant, will Eden Hazard be in the Chelsea team this afternoon? We shall find out in the next 20 minutes or so. Mourinho talks numbers. Well number 10. A lot. Chelsea boss Jose Mourinho doesn't fancy Eden Hazard as a central player behind the striker. Hazard, who usually plays out wide, persuaded Mourinho to let him play in the middle in last week's win over Norwich. "We have different concepts of number 10. Me and him," Mourinho said. "I like a number 10 to score goals. I like a number 10 to get in the box. I like a number 10 to score Oscar goals against Maccabi. "A number 10 for me is an eight and a half when the team loses the ball and a nine and a half when the team has the ball. "For me a number 10 does a lot of things, with the ball and without the ball. "So for me a number 10 is a very special player in my team, when I play with a number 10, which in Chelsea in the last period we are doing. "In my first period here we played without a number 10. We played with two number eights. In a system of two midfield players and a number 10, I demand a lot from a number 10. Would you take Kane or Costa? "Harry Kane. He gives more in terms of what he offers to the team and is in a brilliant vein of form now. He leads the line brilliantly, and leaves everything out on the pitch. Diego Costa doesn’t look happy at all. You don’t want to take the devil out of him but even watching him coming off at half time against Maccabi Tel-Aviv, he was giving it off to the bench." Jack White: In preseason played two full games one after each other, first game left mid, second left wing back. If you are just waking up and missed the shenanigans overnight, Britain's Tyson Fury pulled off one of the great boxing upsets as he outpointed Wladimir Klitschko to become heavyweight champion of the world. It was a dour and often messy fight but Fury, courtesy of his superior boxing skills, fully deserved to be awarded a unanimous decision. Ukrainian Klitschko, whose nine-year reign as champion was brought to an end, simply could not work the challenger out and did not do enough to win. Fury, who was awarded the fight 115-112, 115-112, 116-111 on the judges' scorecards, is now the WBA, IBF and WBO champion. The 27-year-old Manchester fighter is only Britain's fifth bona fide heavyweight world champion after Bob Fitzsimmons, Lennox Lewis, Frank Bruno and David Haye. Manchester United were not quite as happy with the occasion as Leicester. When asked if he was happy with a point by BBC Sport, United midfielder Bastian Schweinsteiger said: “Why? "We are Manchester United. If you want to win something, you have to win at Leicester. We didn’t play well." But both Schweini and boss Louis van Gaal were gracious about Vardy's record. "Vardy is playing really well and is dangerous," said the midfielder, while his boss said the record was "amazing and fantastic". Unless you spent Saturday in an information black hole, you'll be aware Jamie Vardy broke the record for scoring in his 11th consecutive Premier League game. The actual result, a 1-1 draw with Manchester United, almost felt secondary. And Leicester weren't hiding how big a deal it had been to them. "We had two objectives - to win the match and try to help Vardy break the record," boss Claudio Ranieri said. "Jamie made the record, it is fantastic for us. Five years ago he played in non-league, it is difficult to grow up so quickly and this fantastic man is not only our goalscorer but he presses, he works hard, he is important." Not the ideal preparation for Tottenham, who played in Azerbaijan's capital city Baku in the Europa League on Thursday night. They arrived back in London on Friday morning after a 2,500-mile flight (5,000-mile round trip) and now they face Chelsea in today's early game. Midday on a Sunday is surely too early for a game of football. At least Chelsea fans haven't got far to travel for their lunchtime match at rivals Spurs. But how about you out there in the real world? What kick-off time woes have you suffered on the recs and parks of this fair land? Ever missed a game because it was too early or late? Ever had to play more than one game in a day at the end of the season? "Arsenal players took 14 min flight yesterday but I'm only person at Salisbury train station this morning getting ready to start cross-country hike to Norwich. The life of the football commentator!" Jamie Vardy and Tyson Fury may have knocked Jose Mourinho out of the headlines for a day - but the 'Special One' could be back in business again should Chelsea slip up at the Lane this lunchtime. Tyson Fury is the heavyweight champion of the world. Jamie Vardy is the best player in the Premier League. Who saw that all coming a year or so ago? Now, after a superb sporting Saturday it's time for a stellar Sunday. We have four Premier League games to feast on including a midday London derby. Tuck in! Welcome to our live page for Tottenham v Chelsea. We'll have text commentary here from 10:00 GMT. You can keep up to date with all the action from today's other Premier League games including West Ham v West Brom, Norwich City v Arsenal and Liverpool v Swansea City.